Here in France, we have the right to wish someone a ‘Happy New Year’ up till the last day of January, so I am just in time even for those of you living in Australia. Phew! ‘Happy New Year’ and, as we say in France: ‘surtout la santé’. Above all else, good health. These last couple of months have been rather hectic. 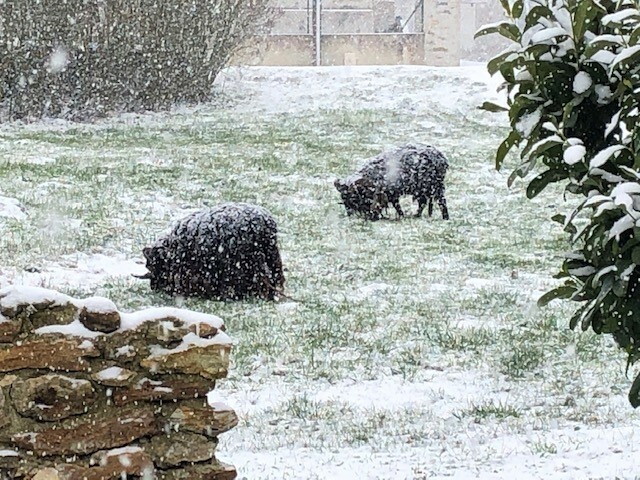 At our home outside Paris, not the Olive Farm, but east of the capital where Michel has his editing studios, we have been snowed in. Indeed, it snowed again overnight. The sheep don’t seem to mind, although they have broken free of their own pastures and come right to the door in the hope of a slice of bread, which they gobble down as long it has not been buttered. We buy in hay but they turn up their noses at it and beg for more bread. They are also extremely fond of curly kale and my climbing roses but won’t touch lettuce or carrots! I am not bothered by the snow or any other weather for that matter as I am glued to the armchair, reading. I am currently immersed in the world of modern Irish literature as I have been invited on the panel of judges for the Listowel Writers Week award. The award-winning festival takes place at the end of May (27th to 2nd June) in Listowel. I will be there to give a three-day writing course on Memoir. Also, I will be talking about my own new novel (see below) which will have just been published. In the meantime, the organizers of the Writers Week have me reading new Irish novels published between February 2018 and February 2019. My, there is some cracking material in amongst those I have so far read. Obviously, I cannot give any recommendations at this stage. All I can say is keep an eye out for some of the fabulous talent coming out of Ireland now. Also, keep an eye on my Events page because we will be putting up listings for Listowel as well as several other events I will be attending to read from and talk about my own novel. If you are in the vicinity, please do come along and say hello and I can sign and dedicate a book to you. In between all the reading and writing and screening of films for Michel’s upcoming festivals, we spent the Christmas holidays (they seem like centuries ago already, don’t they?) walking. I don’t mean we have been hiking the Alps. No, nothing desperately strenuous or too time consuming. 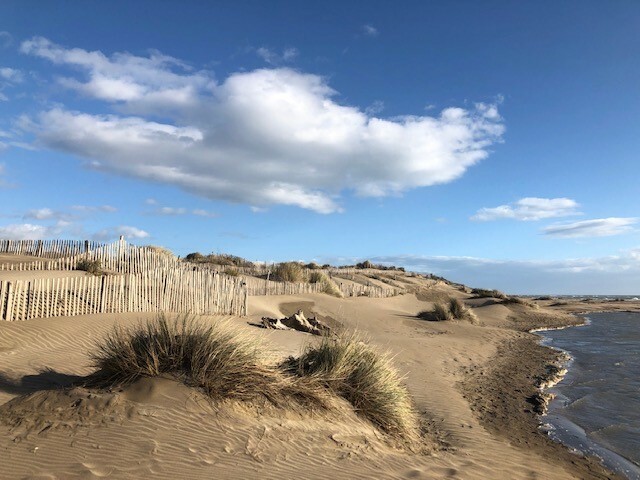 Every day though we have been taking a couple of hours to walk some of the lovely beaches close to our Olive Farm where the weather has been warm and sunny. From Cannes to the Camargue. By the way, the new novel, THE HOSUE ON THE EDGE OF THE CLIFF is set, aside from Paris, in and around Cassis and La Ciotat and the stunning Calanques (creeks) east of Marseille. So, I have had the perfect excuse for ambling about by the sea. Here are a couple of photos of where we’ve been walking to set you dreaming, or remembering. And in a junk shop somewhere along the coast I found these fabulous secondhand books. These will feed me with plenty of local history and offer me ideas for novels to come. I have just returned from recording two of my novels for audio. The first is THE HOUSE ON THE EDGE OF THE HILL, which some of you will already know is my new novel to be published on 16th May. The same date for the e-book and audio book. I had hoped to reveal the cover to you with this letter but over at the publishers they are still tweaking so, unfortunately, for the moment it remains a secret. However, I can gleefully report that it is looking stunning and that the few who have read the book so far seem very excited about its future. So, that is very heartening news for me. It is an “epic love story with danger at its heart” that begins in Paris in 1968 and moves between the present and past frequently along the shores of the French Mediterranean. The other book I was recording for audio is THE LOVE OF A STRANGER which is the most recent of the Kindle Singles, novellas, I have published with Amazon. If you would like to read it as an e-book, here are the links for both the UK and the States. If you prefer to buy it as an audio book it should be available in April. I don’t have a precise publication date yet but I can let you know in my next Newsletter. For those of you, and there are MANY of you, asking after Samson and how he is settling in with us, Michel built him his own kennel over Christmas. The one we bought for him, the largest on offer at the pet store, was too cramped for such a large fellow. There is nothing quite as rewarding as taking in a rescue dog. To observe the changes that take place, the level of love they offer and the shift to the peace they find when they know, because they really do seem to know, that they are loved and wanted and secure. So, here he is: Samson, settled and at home. By the way, I discovered on his papers from the refuge centre that he was born on Christmas Day. We gave him a huge bone, which he devoured in minutes. I hope to meet some of you during my travels and events this year. Do keep writing to me. I love to hear from you, those letters from all across the world. It is wonderfully reassuring to know how far my books are travelling. Keep well and healthy and know that happiness is about the small stuff, the appreciation of life’s daily miracles. Here’s to a fabulous 2019.